Life insurance consumers increasingly don’t value or connect with their carriers, and current technology trends won’t help. Left unchecked, this problem will make it difficult for the industry to fend off challenges from more emotionally-savvy competitors. Given the deeply personal, life-changing benefits that life insurers provide policyowners and their families, you might reasonably expect consumers to have warm, fuzzy feelings toward life insurers. You would be wrong. Our recent survey results suggest that consumers are increasingly disconnected from their life insurers. 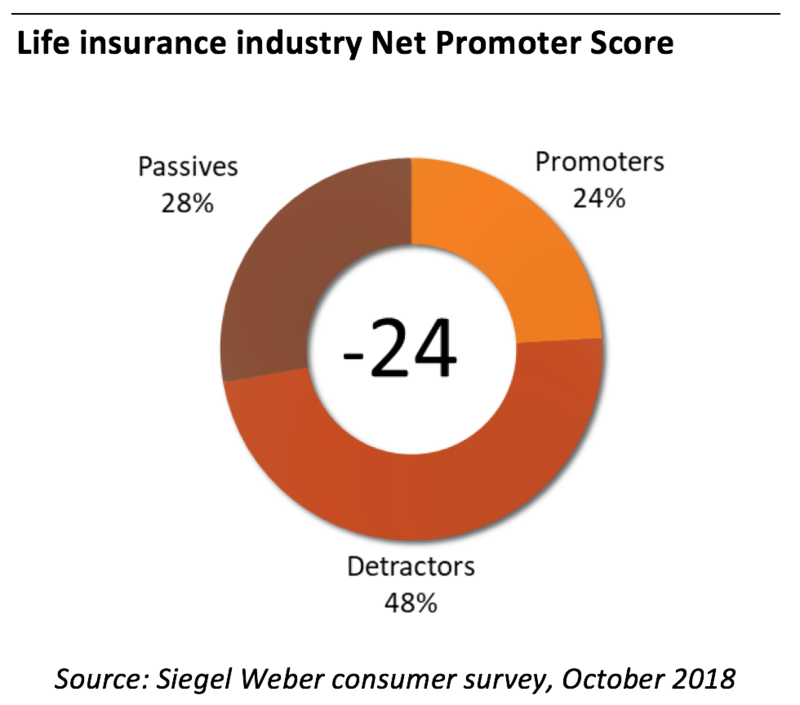 Via the Net Promoter Score (NPS) methodology, life insurers overall scored a -24, which is full-on “ugh” territory. Nearly half of our survey respondents fell in the Detractor bucket, which is a score between 0 and 6 on a 10-point “likelihood to recommend my insurer” scale. This suggests a high amount of antipathy toward the industry, and places life insurers near the bottom of a long list of industries. By way of comparison, life insurers’ neighbors on the list include long-time NPS underachievers like government and Internet/cable TV providers. their products. In any case, the comparison is tenuous because your ability to live-stream your favorite shows is a commodity in a way that protecting your family’s future should never be. Life insurers face a series of well-known challenges. They sell a complex product that can quickly cause a potential buyer’s eyes to glaze over, while simultaneously forcing a conversation about—hooray!—the policyowner’s death. They often leverage a commissioned sales force, which raises fair questions about agents and their motivation. They require policyowners to accept on faith that the company will be around several decades hence to honor a claim. And from a customer’s perspective insurers have an apparent focus on collection of premiums, which is far and away the most common policyholder interaction with their life insurer. It is no wonder that life insurers generate low NPS scores. If you are a life insurer, aspiring to provide a lifetime of value for your customers, this is all bad news. But something worse is about to hit the fan. 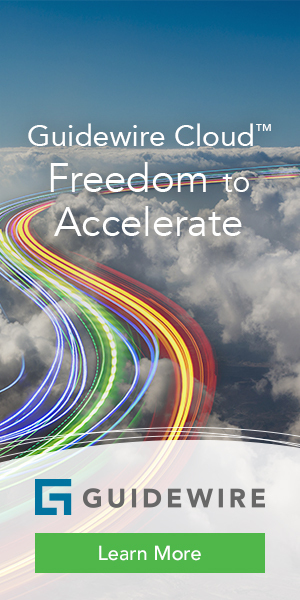 The past 20 years have seen an unrelenting focus on decreasing costs, improving risk selection, and service automation. As a result, the balance between human-driven and technology-driven experiences has shifted toward technology. Chatbots and AI are in vogue, with a central focus on minimizing how often human interactions are allowed to take place. In the extreme, relationships that used to be nurtured by regular face-to-face interactions will be driven by rules engines and data-driven algorithms, and human interactions will become the exception. In life insurance, the “rise of the machines” is real. 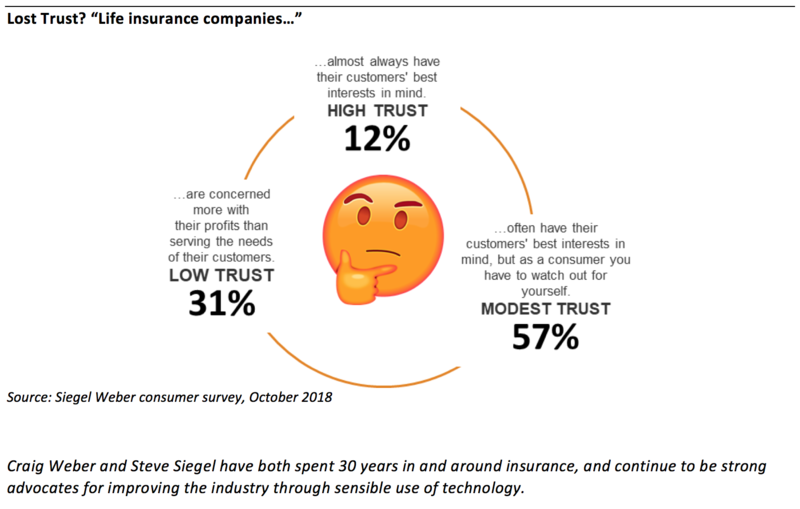 These trends are likely to cause further deterioration of the tenuous, low-trust relationship that most consumers have with their life insurer. Typical life insurance consumers may not know how or why their experiences are changing, but they feel the impact of all that technology. This is certain to further commoditize and weaken the carrier/consumer relationship. costs, poor cross-sell, high lapse rates, and the opportunity cost of poor word of mouth. This drastically reduces the industry’s ability to function at a profit while simultaneously serving their customers. We do not believe that time has run out on life insurers. The tech giants outside of insurance, as strong and capable as they are, are not well positioned for a quick industry takeover. But while the game clock has not yet hit zero, it is clearly ticking down. We believe that life insurers would do well to rethink their strategies to earn a position as their customers’ trusted financial partners. Where technology is concerned, a guiding principle should be carefully enhancing the emotional bond between consumers and insurers, rather than letting relationships become more brittle as new technologies come online. The old adage that life insurance is “sold, not bought” suggests that the industry knows a thing or two about nurturing relationships. It’s time to double down on that knowledge. Craig Weber & Stephen Siegel // Craig Weber is a well-known thought leader and independent consultant, focused on financial services technology. Previously, he was CEO of industry analyst firm, Celent. During his 30-year career as a consultant and analyst, he has advised dozens of insurers, banks, and technology vendors on IT and business strategies. He is a passionate advocate for sensibly creating business value through technology. Weber is frequently featured as a speaker at industry events, addressing diverse topics such as innovation, IT strategies, and emotional connectivity. His comments on business and technology topics have appeared in USA Today, The Chicago Tribune, AP Newswire, Best’s Review, Business Insurance, and Technology Decisions, and he has appeared on CNBC’s On the Money. He has written numerous columns for publication and maintains an active research agenda focused on the transformation of financial services. Stephen Siegel is an entrepreneur, board member, business executive, and independent consultant with a strong focus on financial services. He has founded and sold several firms and was a co-founder and Managing Partner for Building2 Investments, a private equity and consulting firm with operations in the US and Japan. In addition, he served as chairman of Andera, a startup focused on customer acquisition technology, which was later acquired by Bottomline Technologies. 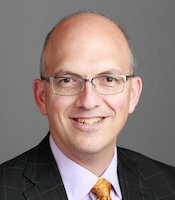 Siegel was a pioneer in the use of AI within insurance, as the director of knowledge engineering for Applied Intelligence Systems, which implemented an underwriting expert system in the late 1980s that underwrote $20 billion in risk annually. Currently, Siegel serves as a mentor for the Hartford InsurTech Hub and as an advisor for the Brown University Entrepreneurship program. He also advises several long-time clients in the insurance space on their technology and business strategies. 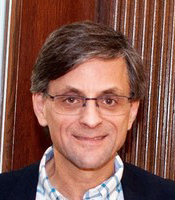 He has a Master’s Degree and his PhD in Experimental Psychology from Brown University.